Perhaps ‘diversity’ sums up the Amman experience better than any other. In Jordan’s inspiring capital city you’ll find cultural, social, architectural and historical diversity by the bucket load. One moment you can be standing in the air-conditioned five-star opulence of the lobby of the Grand Hyatt Amman Hotel and the next find yourself amid the seven thousand year old ruins of Amman’s once-mighty, and still magnificent, Roman citadel. Detractors might claim that Amman has become too westernised and doesn’t possess the authentic heritage or attractions of other middle-eastern hotspots such as Cairo and Petra, but they’re a) wrong and b) missing the point. It’s the contrasting nature of Amman that makes it so special. Those who arrive in Amman seeking an historical adventure worthy of Indiana Jones himself can’t fail to be delighted by the wealth of historic sites and attractions on offer. The aforementioned citadel sits high on a hill overlooking modern Amman and offering spectacular panoramic views of the city; truly a case of old meeting new. In fact the Romans left behind a number of artefacts for Amman’s guests to enjoy today. The city’s amphitheatre is remarkably well-preserved; so much so that it is still used for entertainment purposes some two thousand years after it was built and retains incredible acoustic properties. For Amman’s truly ancient treasures though, the National Archaeological Museum is the place to visit. Where else would you expect to see some of the Dead Sea Scrolls or rhinoceros teeth that are more than 200,000 years old? Amman’s museums present a good example of the city’s historical and cultural diversity. If ancient relics aren’t really your thing, how about a museum that showcases the extensive collection of prestige vehicles that once belonged to Jordan’s late King Hussein? Forget the pomp of ornate horse-drawn carriages normally associated with royalty; at the Royal Automobile Museum you’ll discover King Hussein’s exemplary taste in cars and motorbikes. The collection contains an exact replica of the very first car invented by Karl Benz (original co-founder of Mercedes-Benz) as well as a host of classic cars ranging from including Buicks, Cadillacs and Chryslers from the 1940s to modern-day Porsches and Ferraris. The King was also a fan of Harley Davidson and Indian motorbikes too, and here you’ll see some of the earliest and rarest models. But didn’t we say Amman was a modern city? You bet. Rainbow Street in the city’s Jabal Amman district is a cobbled-mile of modernity and one of Amman’s trendiest places to hang out. This is where you’ll find chic cafes, fast food joints, the hottest nightclubs and the coolest bars. Truly diverse and cosmopolitan (getting an authentic Italian coffee is no problem on Rainbow Street) the neighbourhood is a cultural hotspot featuring art galleries and bookstores and the unmissably atmospheric Souk Jara market at which local artisans proffer their paintings and handicrafts. Final, clinching proof of Amman’s diversity? Amid the city’s exciting treasures both ancient and modern, authentically eastern or influenced by the western world, you may be surprised to spot a facsimile British red telephone box. 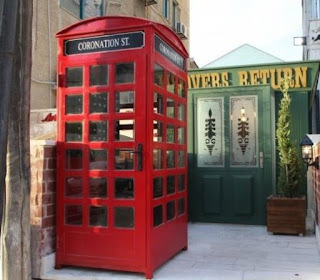 It stands outside the Rovers Return pub. In Amman. Yes, this really is a traditional English pub, albeit somewhat grander than its Coronation Street namesake, and yes it really does sell fish and chips along with the ale. In fact, all that’s missing is Betty Turpin’s legendary hotpot. Amman has a diverse cuisine, naturally, but that might be taking things a little too far. John is a freelance travel journalist who have travelled extensively across the Middle-East and Asia.